Right Angle Weave - Bead It! This is a great bracelet to learn Right Angle Weave. 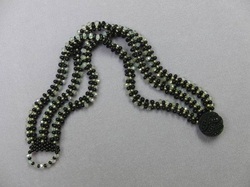 Create a base with 11/0 seed beads, then embellish the top with 4x3mm rondelles! Two colors of Superduos make the pattern for this pattern created by Donna! Donna's newest creation ... Looks like a vintage chain and it is so easy! 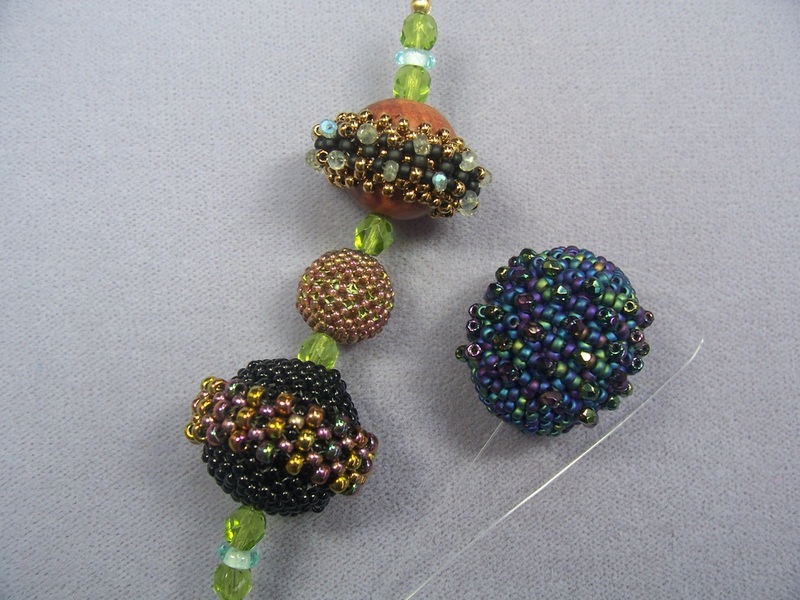 Learn to encase or simply embellish a wooden bead using Right Angle Weave and a variety of seed beads. Our very own Laura helped invent this! We loved her elements and use of negative space (we made our negative space smaller), then Donna inventively embellished it! Not too hard, and very impressive! We use 4mm Swarovski crystals to create this beauty! Using 4mm something-or-other (Swarovski crystals or pearls, stone, you decide!) 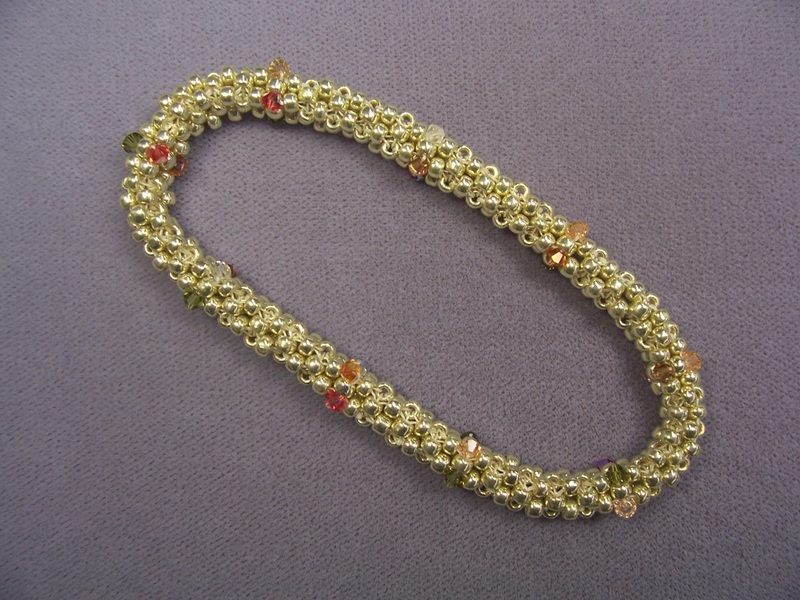 and sizes 11/0 and 15/0 seed beads, learn a very basic Right Angle Weave technique. 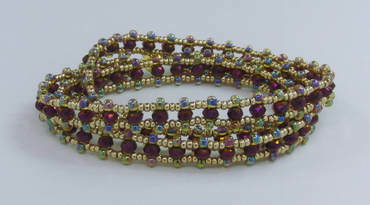 On a base of 3 or 4mm fire polished beads, we will use 4mm Swarovski crystals to create a bracelet that brings the bling! This pattern works up fast. Using 4mm Swarovski crystals, 3mm Swarovski pearls, and size 11/0 and 15/0 seed beads, we'll wind our way to greatness! Using several sizes and shapes of beads, create an organic piece of art. Create this relatively quick bracelet with ease! Great use of Superduos beads. So pretty! Wear it plain or embellish it with pearls for a more regal look. This is perfect as a gift for the holidays, either for a friend or yourself! 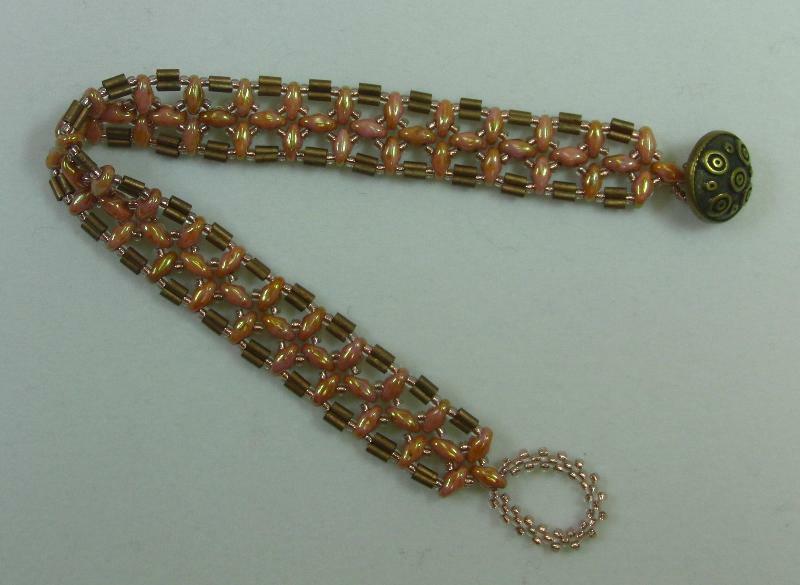 Create this fun multi-strand bracelet with basic, one-row Right Angle Weave. We will be using Farfalle beads and tiny crystals.